One week ago over 150 people showed up for the opening of my Pulitzer Center show at the Apolis Common Gallery in Downtown Los Angels, entitled “Buried in Dandora: Waste and Livelihood” — it was an amazing night. In addition to the main show, my director at the Pulitzer Center, Nathalie Applewhite, and I spoke in 9 classrooms in inner-city Los Angles. As well, my co-grantee David Conrad and Nathalie, spoke at the exclusive Soho House in West Hollywood to actors, producers and members who had an interest. 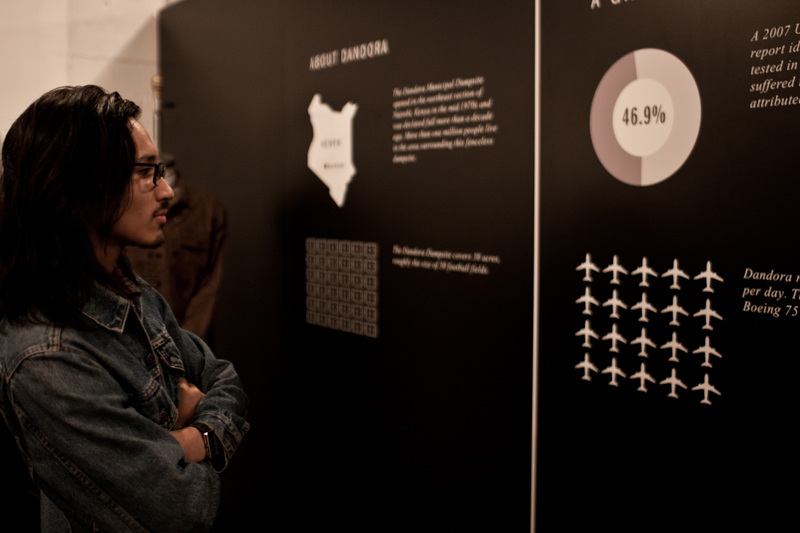 On December 7th, in front of more than 150 guests, Apolis unveiled a new photojournalist exhibition at Common Gallery titled: “Buried in Dandora: Waste and Livelihood.” This exhibition was co-hosted with the Pulitzer Center on Crisis Reporting based in Washington D.C., and capped off a momentous week that included nine presentations in local Los Angeles schools and a live Q & A at the historic SOHO House in West Hollywood. 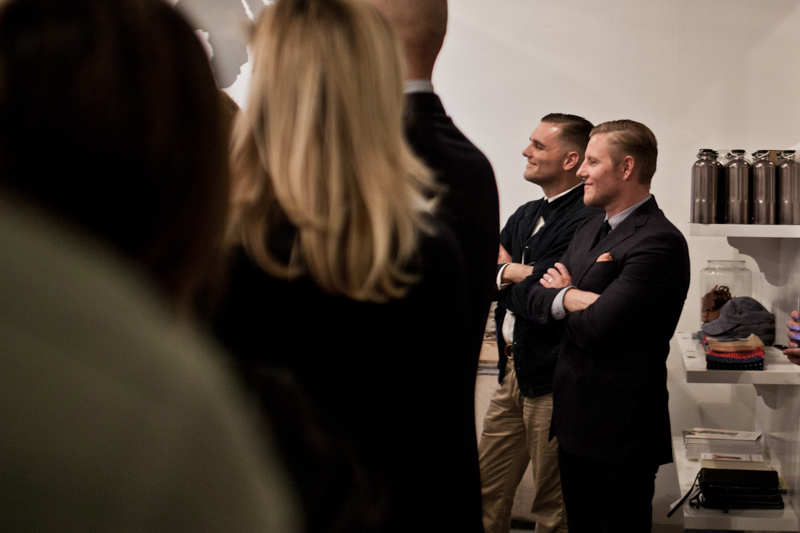 The December 7th opening attracted press, students, non-profit directors, photojournalist enthusiasts, small business owners, and Apolis supporters. After a brief period of mingling and enjoying hors d’oeuvre compliments of FarmShop and drinks from Pharmacy, Apolis Brand Director, Shea Parton, quieted the crowd in order to introduce three special guests. First up was photojournalist Micah Albert. Micah is an Apolis Advocate and Pulitzer Center grant recipient whose photography was the focal point of the evening and who has had 75 reportage stories featured in publications including: The BBC, The LA Times, Foreign Policy, and The San Francisco Chronicle. Next, Shea introduced David Conrad, a journalist pursuing his doctorate at the Annenberg School for Communication, University of Pennsylvania, who has been on staff at Reuters, the New York Daily News, and Business Daily Africa. Finally, Nathalie Applewhite, the Pulitzer Center's Managing Director, was introduced, and then facilitated a brief Q & A with Micah and David. The energy and engagement in the crowd was palpable as Nathalie asked Micah and David questions including: “Why did you choose to do a story on Dandora?”, “What surprised you in Dandora?”, “Which Dandora resident embodies a larger storyline?”, and “Can images create change?” As Micah and David answered these questions, the narrative and complexities of the Dandora Municipal dumpsite became clear. Dandora is the only dumpsite for Nairobi, Kenya and was supposed to be shut down more than fiteen years ago. Instead, 2,000 tons--or the equivalent of twenty 747 airplanes--is dumped daily at the site, dramatically affecting the lives of nearly one million residents who live in the slums surrounding Dandora. Micah revealed one of the biggest surprises for him was how difficult it was to gain access to the dumpsite. He initially had trouble convincing a taxi driver to take them to Dandora and only received safe passage after going through the leader of the local cartel named Tiger. David observed innovation and livelihood in Dandora, epitomized in an image of two young girls sorting through the trash to find candy, and Rahab, a woman who works as a “picker” in the dumpsite to support six children. The evening closed with Micah reflecting on the question: “Can images create change?” He responded by stating: “This is a question that haunts me in my sleep…there are so many times when I wish I could do more than just take someone’s picture.” However, he also shared that while visiting local high schools in Los Angeles—a key component of the Pulitzer Center’s education outreach—he was struck by how students answered this very same question. High schoolers pointed to iconic images from the 20th century that shaped public opinion and forced policy makers into action. We would like to thank the Pulitzer Center, Micah Albert, and David Conrad for inviting Apolis and our supporters into a global conversation on an under-reported story. We are especially honored that the Pulitzer Center chose to host one of their first west coast events at Apolis: Common Gallery. Finally, we look forward to hosting more events in 2013 that will take us beyond the four walls of our headquarters, beyond the streets of the Arts District, beyond our city of Los Angeles and help us engage with the wider world. Apolis Film: Global Citizen Gatherings, Apolis: Common Gallery from Apolis on Vimeo.